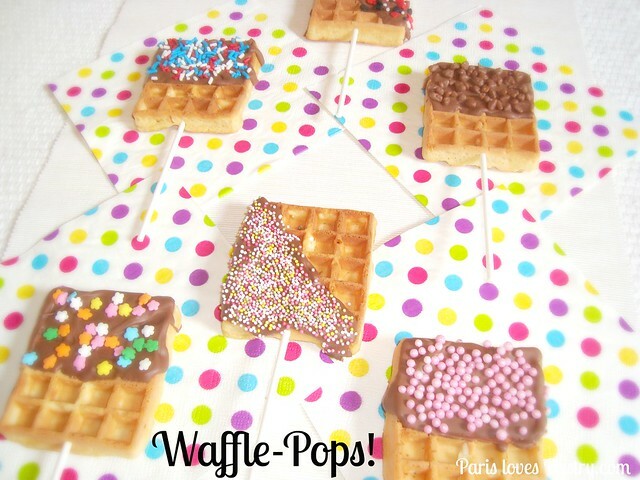 Paris Pastry: Chocolate Waffle Pops! The New Rage. 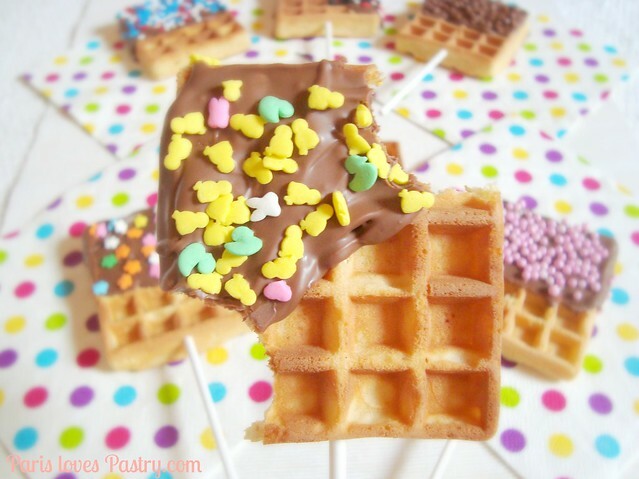 Chocolate Waffle Pops! The New Rage. I never quite got into the whole cake-pop rage. While cupcakes and macarons are sold in many shops here in Europe, cake pops still haven't shown their cute little faces. Making them myself? Only if they have a chocolate coating. The overly-sweet, but oh-so-pretty colorful cake pops are just... too... sweet! So, I'm starting a new trend. I spotted these on a baking blog, but I completely forgot which blog it was. Enfin, they're so super easy to make. You can of course make waffles yourself, but I figured the store-bought ones are a bit more solid of texture and would hold better on a stick. I melted chocolate, poured it on top, used a spatula to even it out, and decorated them with many many colorful sprinkles. I popped them into the refrigerator and voilá! Happiness on a stick! :D Rating: 5 out of 5. 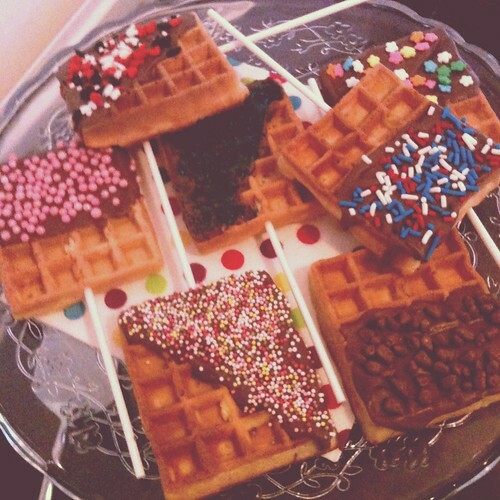 Chocolate waffle-pops in my cake dome, on Instagram. What a clever idea! 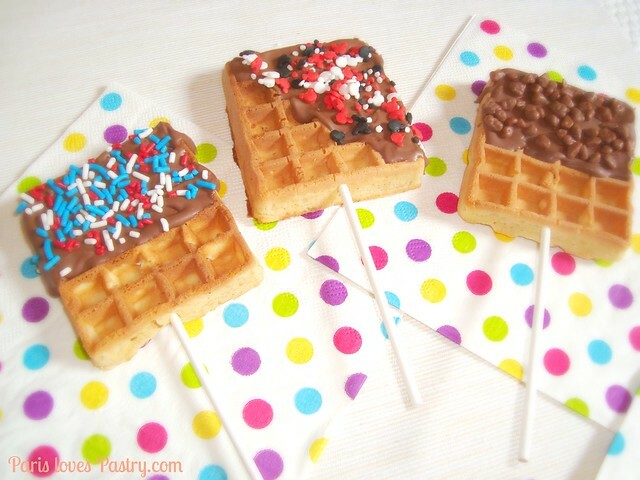 I've never been a huge cake pop fan - I guess I'd just rather have a slice or a cupcake, but the waffles are a great idea. I think I'd even eat one for breakfast! Where did/can you buy them? Oh my, these look sooo yummy!! you re making me FATTER! Shut the front door! 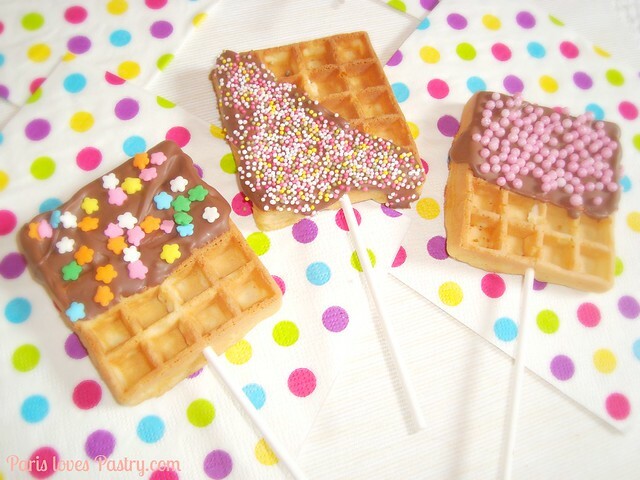 Those waffle pops look like heaven. I feel like that MIGHT be the best combination ever. Apologies! The 'Contact' link isn't currently working.